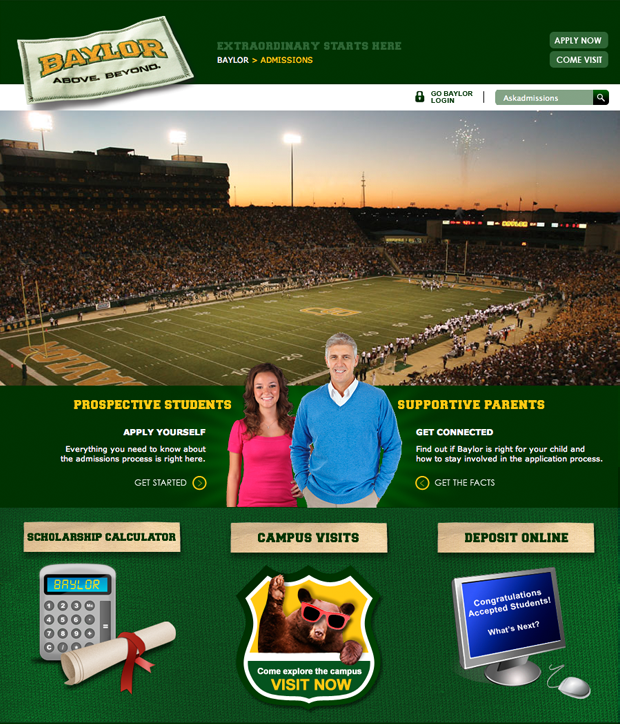 Baylor University needed a complete overhaul of their admissions website. From a user experience, the site was a mess. Important information was hard to find, redundant and occasionally out of date. That’s the last thing you want when considering a college. Working closely with the Kolar creative and interactive teams, I dismantled the old content and assembled a new site structure. The process took more than six months and seven content documents for different userflow needs. Now, Baylor has an admissions site as impressive as the university itself. Sic ‘em Bears! Deciding where you want to go to college is a big deal. It’s more than just which team colors you like the best or which town you want to live in. You can go to class just about anywhere. But at Baylor, we believe we can help you find your true calling. This site is designed just for you. We’ve made it easy to find out why you should consider Baylor, and how to make your college dreams come true.